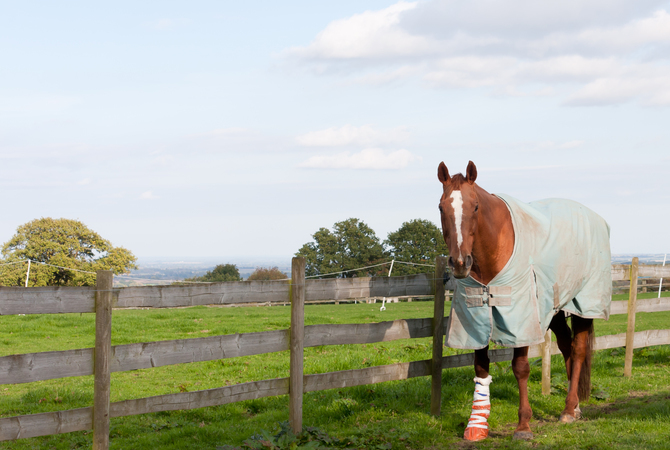 Blanketed horse with wrapped and bandaged leg walking in pasture near fence. 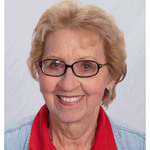 We have all been in the situation where we go out to feed or bring our horse in for the evening and we see right away that something is not right. As we move closer, we see blood oozing from a wound on the horse. The heart sinks and the brain goes on rapid fire. But, before you panic, take a deep breath and calmly assess the situation. Being prepared for such an event, makes all the difference! Here are some preventative measures, some handy items you should have in the barn, and then some fail-safe care measures that apply whether it is a mild or serious injury. The first and most important preventative measure is to maintain fully-stocked and fresh first aid kits in your barn and trailer. Keep your horse current on tetanus shots, and not only teach your horse to stand still and behave during intense handling, but figure out how to keep him safely restrained if you need to do so. If the wound is pulsing, that is a sign of arterial injury and you will need to stop the bleeding. You have about 10 minutes before it becomes critical. Is there a foreign object in the wound? If there is, stop the blood flow as best you can and LEAVE IT ALONE; pulling it out may actually cause more damage. If none of the above is present, stop the bleeding using gauze pads or towels. Apply pressure to the wound. If the wound is shallow, flush it gently with saline solution or water. Rinsing removes all the debris and dirt from the wound. Clean the wound daily with a strong 7 percent iodine solution to make sure the wound does not close up. Puncture wounds must heal from the inside out. To determine depth, use a clean Q-tip and push it in as far as it will go, swabbing iodine on the inside. Covering a puncture wound with a bandage or wrap causes the wound to heal on the outside but allows bacteria and infection to form on the inside. Repeat the swabbing every day until the wound is healed. Remove any scabs that may form daily. It is always advised that with any puncture wound the horse should be on a run of antibiotics to prevent any deep-seated infection. Assess the area that has been skinned and evaluate the extent of the damage. There may be a large area of abraded skin, but most of the time the skinned area has superficial damage without any areas of concern. Look for debris, dirt, or small puncture wounds. While the wound may look superficial, it is possible that deeper damage has been done by the force of the injury. Broken or chipped bone may lie beneath the surface and, depending on how sensitive your horse's skin is, you may have deeper skin tissue trauma. YOU know your horse and what is and is not normal or superficial. It is going to be your accurate assessment of your horse and its injury that determines how quickly your horse recovers. If the wound does not look deep, clean the wound using LARGE volumes of water. Here is where use of a barn hose is perfectly appropriate. Rinse the area repeatedly with diluted Betadine or a similar solution to help clean the area. Disinfectants help not only to remove debris but to kill bacteria. Do not rub or scrub these areas as they are tender and you will probably intensify the wound damage. It is not necessary to call a veterinarian unless you suspect deeper damage. The area will definitely swell and be tender. Using hydration on a daily basis will help keep swelling at a mininum and ease any pain your horse may be suffering. Talk to your veterinarian first, but using Bute will also help with the swelling and inflammation. Keep the area moist by using an ointment like A & D or Triple Antibiotic. Some horses have sensitive skin and deep tissue damage may result in scarring of the follicles in the skin and the resulting hair may come in white. Measure the wound so that you can tell the vet the length, width, and depth of the laceration. If the wound is not serious, stop the bleeding by using a clean towel and applying pressure on the wound. Clean the wound with diluted Betadine, being careful not to damage the skin flaps. Cover with non-stick gauze and an elastic bandage. Veterinary consultation is recommended as it is always difficult to tell if there is going to be lasting damage. The most common reason horses do not heal fully from laceration wounds is because of a condition known as proud flesh. Proud flesh is actually normal granulation tissue that has overgrown the edges of the laceration site. A wound with proud flesh will not heal properly because the skin will not cover it. Anything that irritates the wound can cause proud flesh, so how you clean and what kinds of caustic powders you use may actually aggravate rather than help. It has also been shown that bandages and casts can contribute to this problem. You may have to bandage, but frequent changes and letting the wounded area air can help. Try and keep the area as dry and clean as possible as it is a warm and moist environment that will help the granulation go crazy. With a little common sense, some conscientious preventative attention (like regular tetanus shots), and your handy first aid kits in your barn and trailer you will be able to either treat or at least triage the wounded area until your vet arrives. Horse Diarrhea - Is It an Emergency?